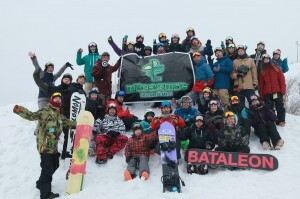 The hosting of “NISEKO PLEASURE 1-DAY CAMP” has been confirmed!! Limited capacity! Entry is on a first-come first-served basis. Applications will be closed as soon as we reach full capacity. Toshiki Yamane (SALOMON), runner-up at the 2013 TOYOTA BIG AIR! The star of Nayoro!? “Mountain Jack” Yuya Shimada (BATALEON)! ■Backup Date: April 13 (Sunday) *Canceled in the event of bad weather. ＊Please be aware that all fees listed above do not include lunch cost. sending a Facebook message, or directly by phone to 090-5076-7377 (Nagata). ■Deadline: April 11 (Friday) *Applications will be closed as soon as full capacity is reached. For further details, check out the NISEKO PLEASURE CAMP Facebook page!